When distant buying and selling is done, there are chances of things going wrong. At times, the product that is ordered is received by the buyer such that it is damaged. As the buyer receives the product in that condition, he should not be held responsible for the damage and he can thereby complain the seller about the damaged product. In such conditions, it may not be the seller’s mistake as the product might have got the damage during parceling but it is certainly the seller’s responsibility to satisfy his customer and replace the product with an undamaged one. This letter can be used to complain the seller/selling company about the damaged product that has been shipped. I am writing to you to file a complaint regarding the damaged product received. I had ordered a toy slide for my kid from your online store. It was a fresh piece that I selected and not the used one. I received the parcel yesterday and when I opened it to set the slide, I realized it was a damaged piece. The pieces of the slide cannot be joined together because the individual pieces are damaged and hence this is of no use for me. 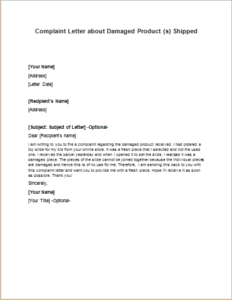 Therefore, I am sending this back to you with this complaint letter and want you to provide me with a fresh piece. Hope I’ll receive it as soon as possible. Thank you!